The main requirement for a good ice blender is the power, which should be about 1500 watts. It is also desirable that the ice grinding function was directly stated by the manufacturer. This means that the motor will not fail at peak load, and the bowl is sufficiently resistant to small fragments of ice. And the last factor to consider is the noise level. Here we offer you 10 top-rated blenders for ice and frozen fruit from 70 to 200 dollars, half of which are budget-friendly (up to 100 dollars). However, if the price does not matter much to you, then pay attention to the Professional-Grade Vitamix 5200 Blender with special ice-crushing blade parts. 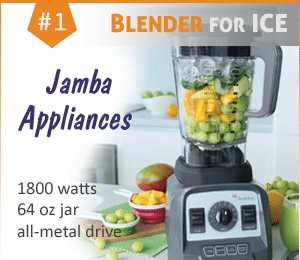 Best blender for ice in 10 seconds: currently, our winner is 1800-watt Jamba Appliances Blender, very durable and well designed. The more affordable Cleanblend, although it has the same power, is inferior in several parameters, for example, it is louder. The third place goes to Ninja Professional with the most capacious pitcher and a very reasonable price. 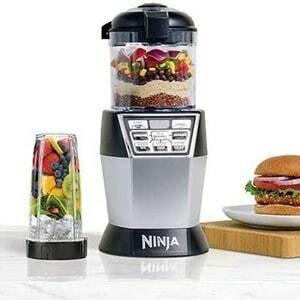 And if you want a more versatile assistant for personal use, then we advise you to consider Ninja Nutri DUO, which has an additional food processor and a very compact size. 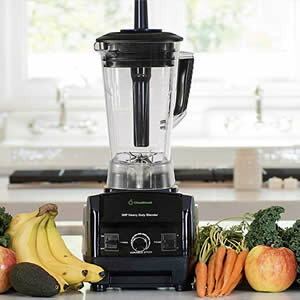 The Jamba Appliances 2.4 horsepower blender is a heavy duty blender that easily crushes ice, makes smoothies or blends soups. The powerful motor moves the chopping blade at 210 mph when it is at top speed. This high speed allows for ultra-fine chopping and super smooth mixtures. The 64-ounce container offers users many distinct benefits. The thick plastic is BPA free and is rated as shatterproof. The design is shorter and wider than many similar blenders which gives this blender significant advantages. The shorter and wider design allows for better mixing of the items within the container. Users can use the tamper with ease when they are trying to move frozen products around because of the width. The short stature also makes it easy to store in your kitchen area. The base of the blender is very heavy which helps keep it in place while using. The illuminated dials help you find the right settings easier, especially early in the morning or late in the evening. The four different speeds allow you to blend your foods to the right consistency. An integrated emulsion cup allows you to slowly add liquids when you are blending to create the perfect texture. The 2.4 horsepower motor runs quietly in comparison to other similar sized motors. Ice crushing is the loudest function, but that is the same with all blenders. Frozen fruits and other foods blend exceptionally quiet. Nuts chop very easily in this blender as well. The blades are not removable in this blender. However, cleaning is very easy, especially with the wider container. 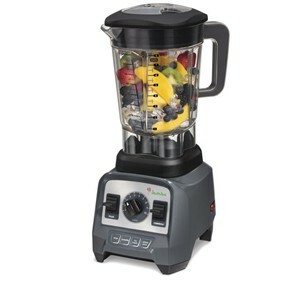 As a final benefit, this blender comes with a recipe book containing 150 fabulous foods you can make with this blender. Everything from main course soups to fabulous smoothies and desserts is included in the full-color recipe book. The Cleanblend blender is one of the strongest blenders on the market. It has a 2.4 horsepower motor and uses 1800 watts of power to blend. 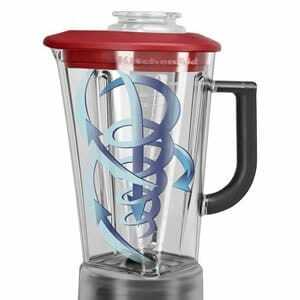 Combine this strength with the eight blade system that this blender uses and you have a really powerful blender. The blender is perfect for crushing ice into an almost snow-like texture. It works well with coffee beans, nuts, and hard spices. It is also very good to use for making soups and very thick batters. The strong motor gives the machine the ability to blend even the thickest mixture with ease. The blender also comes with an easy pour funnel, a spatula for scraping the sides without etching the pitcher, and a nut milk bag. The blender has a heavy plastic 64-ounce pitcher that is simple to clean. The plastic is 100 percent BPA free, making it safe to use for anything you blend. The entire machine is easy to clean. For quick cleaning, add warm water to the blender with a little dish soap and blend, this ensures that the bottom of the blades is very clean. Rinse when completed. 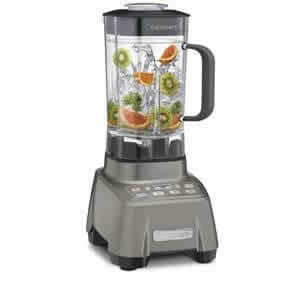 The blender is louder than similar blenders due to its very strong motor. Most blenders have smaller motors and run quieter. 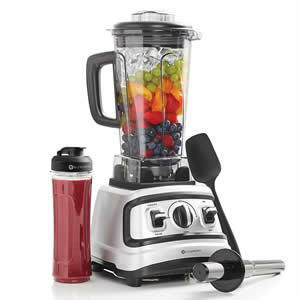 However, the superior blending that you receive with this blender far outweighs the louder motor. As with any blender, you are encouraged to pause the motor while blending so that it does not overheat. This is especially important with very heavy or thick blends. It is recommended to pause once a minute for at least 30 seconds. 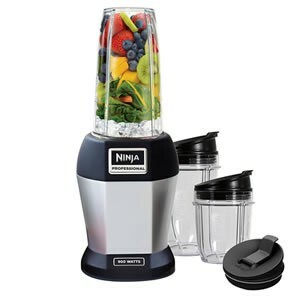 With a sleek design and excellent performance, the 1000 watts powered Ninja Professional Blender can take on blending, pureeing, crushing ice, and controlled processing in just a few seconds. This professional blender is ideal for making smoothies and drinks for the entire family with its extra-large, dishwasher-safe 72-ounce cup with a pour spout and lid. The Total Crushing Technology is able to crush and pulverize vegetables, and whole fruits in just a few seconds. If you are looking to make ice into snow, the Ninja Professional Blender has the power, plus it can blend your favorite ingredients into a delicious dip, sauce, or smoothie. When you entertain, you want a blender that can make margaritas or mojitos for the entire crowd, not just a few at a time. The Ninja Professional Blender is a good option for those that entertain a lot and want to keep the drinks flowing. Does not completely pulverize everything and leaves little pieces of kale etc. Versatility is a fabulous feature when it comes to a blender. The Nutri Ninja Nutri DUO is the perfect example of a blender that can starts as a robust Nutrient&Vitamin Extractor and turns into a versatile Nutrient Fusion Processor. The Ninja Nutri DUO easily breaks down ice, whole foods, seeds, and nuts to make nutrient-rich smoothies, purees, and pops. With a 1200-watt base and two interchangeable vessels, the Ninja Nutri DUO allows you to create flavorful snacks, drinks, and meals with just a touch of a button. The featured Auto-iQ Technology provides intelligent programs that mix specifically timed blending, pulsing, and pausing patterns that do all of the work for you. Plus, the Boost option gives you the most control of consistency and texture. 24 ounce Nutri Ninja Cups allow you to take flavorful and nutritious super juices with you while you are on the go. The kit also includes a blade for the dough. 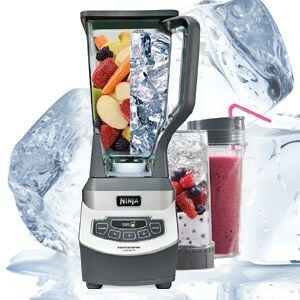 Depending on how you plan to use your blender, the versatility of the Ninja Nutri Bowl DUO can help you create ice oriented drinks, plus a ton of other things. If you like using your blender to create desserts, pops, and soups, the Ninja Nutri Bowl DUO is worth checking out. The Cosori 1500-watt blender is one of the best blenders for your kitchen if you plan to use the blender for many different tasks. The blender is built for heavy-duty use and has a strong enough motor to handle frozen items, grinding and thick doughs. The blender has a variable speed control that allows you to do everything from pulsing the food products to placing it on a high-speed mix. You can easily grind nuts, spices and coffee beans in this blender due to the six razor sharp stainless steel blades. Puree’s and soups come out smooth and silky, and frozen drinks are always mixed to perfection. The 70-ounce pitcher is BPA free thick plastic and is large enough to make family sized portions. The blender also comes with an additional water bottle that you can fill and take your delicious drinks on the go. One of the best functions that this blender offers is the cleaning function. Since the blades are incorporated into the pitcher itself, all you need to do is put really warm water and a few drops of dish soap in the blender and blend. It cleans itself and you no longer have to worry about cutting your hands when you clean the blender disassembled like many other products. The blender is rated for heavy duty blending, but it is recommended that you do not run it for more than a minute at a time, giving it a 30-second rest between mixing. While this may sound inconvenient, it really is not since most things mix in less than a minute anyway. Running the mixer without pausing can lead to overheating of the motor and the products that you are blending. The BlendWorks all-in-one high strength industrial blender is the right blender for your kitchen if you love to make smoothies. 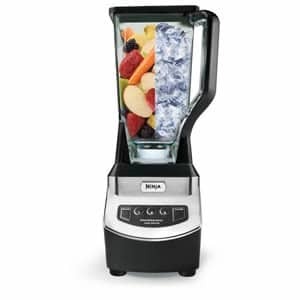 This blender has a 2 horsepower motor which makes it absolutely perfect for crushing ice until it is very fine, giving your smoothies the extra silky feeling that makes them great. The BlendWorks machine has variable settings and allows you to chop ice into different sizes. It also has settings that allow for coffee bean grinding as well as soup making. The blender has six very sharp stainless steel blades and has a 70-ounce pitcher that allows for multiple portions to be made at one time. The pitcher is made from a heavy gauge plastic instead of glass. This allows more weight of the machine to be focused on the bottom where the motor is located. Along with the gripping matt on the bottom of the machine, the machine does not bounce around when in use. The blender comes with a beverage bottle for on-the-go use and a spatula so that you can easily scrape the inside of the pitcher without scratching the container. It is very simple to use and has a super sleek design. The blender is rated as BPA free on all qualifying parts, making it a “healthy” machine for you to use as well. As an added bonus, the lid to the machine has a superior seal that prevents leakage and a removable measuring cup that measures both in ounces and milliliters for your convenience. As with all blenders, it is recommended that you do not run the blender for more than a minute straight at a time without a 30-second rest. This helps prevent the motor from overheating, especially if you are doing some heavy-duty ice crushing or blending thick mixtures. When you want a blender that has a powerful motor but is also technologically advanced, the Cuisinart Hurricane blender features 2.25 peak HP motor handles and can pulverize everything you can throw at it with ease. It has a double housing design that keeps the blender quiet and a 60-ounce BPA-free container that has a unique design for easy pouring, plus a secure grip handle that has a soft-touch. The Cuisinart Hurricane sits on a heavy-duty plastic base, and it operates with just a touch of a button with several options available including Pulse, Smoothie, Ice Crush, Low and High. It also features an automatic load-sensing technology that can sense a load and when to adjust your speed so your blending in uninterrupted, plus it has an LCD display that includes a programmable countdown timer. The sleek design makes the Cuisinart Hurricane a great addition to any kitchen décor. This is a durable product with a strong assembly including 4-prong stainless steel blades made of heavy-duty, commercial-quality construction. The Cuisinart Hurricane not only is a great ice crushing blender, but it is also a nice looking appliance to place on your counter. It has a lot of technological features to it as well for those that like appliances that have all the latest features. If you wanted a basic blender, you could easily buy the cheapest version you can find. But, when you are looking for simplicity without sacrificing on quality, you need to look at the Oster Reverse Crush Counterforms Blender. This is a medium capacity blender with a six cup, dishwasher safe glass jar that has been Thermal Shock tested, so you can make a frosty cold margarita or pull it right out of a steamy dishwasher without a problem. This blender features a stainless steel 6-point blade to pulverize ice to make perfect frozen drink each and every time. With 1000 watts, the Oster has enough power for every use from making salsa and dips, to frozen drinks, and sauces and soups. It is backed by the superb quality of All Metal Drive as the two pieces are connected by metal instead of plastic making it more durable so it will last longer and function flawlessly. 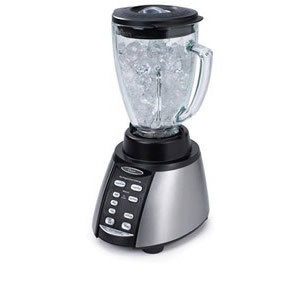 As for the number of programs, this blender has 2 pre-programmed settings (frozen drinks and food chop), 2 manual settings for ice crushing (high and high pulse), and 3 other modes: medium, low and low pulse. The six cup Boroclass Glass Jar is dishwasher safe and easy to clean. And the two-ounce filler cap has measurement markings to help measure and pour ingredients while you are blending. When you are on the go, the Nutri Ninja Pro gives you powerful Nutrient & Vitamin Extraction performance with 900 watts of power that can break down vegetables and fruits for delicious and nutrient juice that you can take with you on a busy day. The Ninja Pro Extractor Blades have the ability to crush through seed, ice, seeds, stems, and skins to give you an even and smooth shake. All parts in the food zone are dishwasher safe and BPA free. The set includes 3 cups (24 oz, 18 oz, and 12 oz) with lids, and a 30 recipe and wellness guide. The Nutri Ninja Pro features pulse technology produces a more nutritious and better-tasting drink. If you enjoy the silky smooth taste that can be made of vegetables, whole fruits, and ice cubes, the Nutri Ninja Pro will quickly make your drink and get you on the road. With a robust motor, the KitchenAid 5-Speed Diamond Blender features a BPA-free one-piece diamond pitcher that includes stainless steel blades and electronic controls that create an intense vortex that is thorough and fast enough to provide exceptional blending results. Plus, the Intelli-Speed Motor Control can sense the contents in the pitcher and is capable of maintaining the best speed to power through all the ingredients. The KitchenAid Diamond Blender also features an exclusive diamond blending system that allows you to mix, chop, stir, liquefy, and puree with pulse 1-5 settings, plus a crush ice mode. The Pulse mode works with all of the speeds so that the blending is staggered while the ice crush mode pulses at fixed times for the best ice crushing results. The Kitchen Aid Diamond Blender has a soft start feature which has a slower speed at first to pull the food into the blade and then it quickly increases the speed setting that you have selected. The steel-reinforced couples give you efficient and direct power that transfer to the blade from the motor for blending that is robust but it has a quiet operation with the coated coupler. The features 60-ounce BPA Free Diamond pitcher is scratch, shatter, and stain resistant, plus it is dishwasher safe and easy to clean. The durable and sturdy die-cast metal base features a control panel with white LED Lights that wipes clean easily. The diamond blending system features a crush mode that pulses at fixed times for the best results. Plus, this is a quiet blender with a coated coupler that features a soft start to efficiently process all the ice. The best blenders that can crush ice are usually countertop blenders. An immersion blender won’t be able to match a countertop blender’s strength, plus the pitcher that comes with a countertop blender will make ice crushing so much easier since you don’t have to keep transferring it from different cups. Also, it ensures that none of the ice will spill out while it is being crushed. One feature you definitely want to pay attention to is the horsepower of your blender. If it doesn’t have enough horsepower, it will jam or refuse to chop up the ice small enough for a margarita or a smoothie. Horsepower is a good indication of how powerful your motor really is. 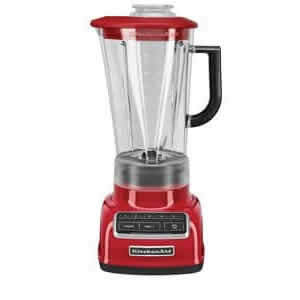 For example, the average 2HP blender can pretty much handle anything you want to chop up, but for a better performance with ice, you will want more power. 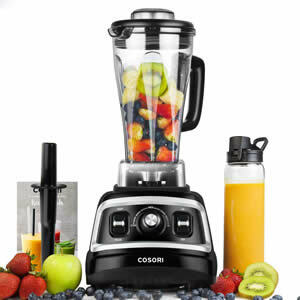 You can also get a good idea of a blender’s power from is wattage. The other power indicator is wattage. 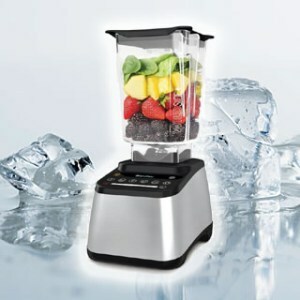 A blender that has at least 500 watts should be capable of crushing ice, although some with lower wattage may be able to at least chop up ice into huge chunks. If you do get a lower powered blender that says it can effectively crush ice, make sure they have the right type of blades and a specific setting to get the job done. Also, keep in mind that when you use a lower-end blender for crushing ice that they may work well the first few times out, but the blades will become damaged which will hinder the blender’s ice-crushing ability and its performance will just go downhill. This can also cause the blender’s motor to burn out. When you are planning on chopping up ice, you will want durable and strong blades as ice can be hard substance to pulverize. Also, your blades can also wear down easily if you make a lot of smoothies, so look blunted blades that are made of stainless steel, or, better yet, that are molded with a durable, single piece part that will lessen the wear of the blades and the blenders but also increase its durability. Also look to see if the blender has a setting for crushing ice or for smoothies. Not every blender needs to have a special setting, but if you see a specific mode or a pulse option, you will know that the blender is designed to handle ice. Blenders tend to be loud, especially when they are crushing ice. However, some are noisier than others, plus they may take longer than others. If you need your blender to be quieter due to special issues like children or you are using it in an office setting, it is always a good idea to test some of the blenders in person or read reviews to see how others found the noise level. If you get frustrated with a blender that leaves a floating top layer of ice while the lower level is ground into the snow, you may want to look for larger containers that take care of the problem or search for a blender with a tamper. It is a mistake to believe that every blender motor will chop up ice the same way, or that any blender motor can chop up ice. Weak blenders with struggle with a pitcher full of ice, plus it will wear out fast. You need a heavy-duty blender that will save you money in the long run. You may make a lot of smoothies just for yourself, but don’t forget that most of the ice-related recipes you will find will require a lot of ice for a party. Always pick a larger container that way you will have a pitcher large enough to handle whatever occasion comes up. You actually don’t need sharp blades for chopping up ice. Sharp blades are good if you are doing specific types of slicing, otherwise, they will get damaged or dull if they try to deal with a lot of ice. The best types of blades for ice are stronger, blunter blades designed for crushing. When looking for a blender that can pulverize ice, make sure you have a strong enough motor and the right type of blades, otherwise, you are just going to burn out the machine quickly. Having an ice setting is a nice feature that way you know the manufacturer was taking ice crushing into consideration when designing the blender. Depending on your preferences, you may want to think about the noise level the blender will make too as that is a deal breaker for some people. Otherwise, with so many choices on the market, you should be able to find something that fits your needs and your price range. How many watts does a blender need to crush the ice? The optimum wattage for blending ice is about 1200 watts. You need a strong motor to make sure that ice is actually crushed instead of just broken into chunks. If you are looking for ultra-fine or “snow” type of ice the blender should have a minimum wattage of 1500. Why is ice added to drinks? There are several reasons to add ice to your drinks. Of course, the first reason is to make them cold or create a frozen treat. 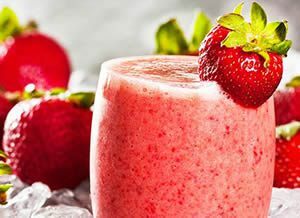 Many people find that drinking a frozen smoothie is more appetizing than just having one that is cool or room temperature. Another reason to add ice to a drink is for texture. Sometimes the ice can “smooth” out the texture of blended drinks to help them be more desirable. The final reason you may want to add ice to a drink is for volume. Ice takes up space and creates more of anything that you are making. It is more effective than water and often does not “water down” the flavor. How much ice to put in a protein shake? Protein shakes do not really require a lot of ice when you blend them. Most recipes only call for 6 or 7 pieces of ice being added to the shake. This is mainly because the shakes are designed to be very condense and you are looking for an easy way to drink a lot of protein all at once. The brand of protein powder you are using may also play a part on how much ice you use. Some protein powders recommend not using over 3 pieces of ice with their shakes because they say it hinders blending. Read any recommendations from your preferred protein shake mix or blend to taste. How much ice to put in a smoothie? If you are making a single serving of a smoothie, you should use about ¾ of a cup of ice. 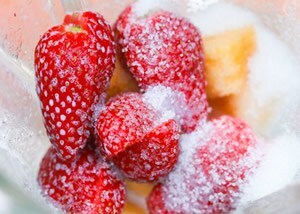 If you are using frozen fruit you may want to drop that amount down to half a cup. This ratio keeps the smoothie tasting great and not overly icy. However, if you want a really thick drink or you are going to put your smoothie in a travel cup to go, you may want to add up to a cup per serving so that it stays colder for a longer period of time. In the end, it is more about preference than actual measurements. How much ice to put in blender for Margarita? 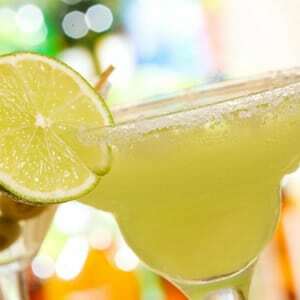 For the perfect frozen Margarita, you will want to add one very full cup of ice per serving. You will also want to make sure that the ice is chopped very fine so that the drink is easy to consume. For large batches of Margaritas, fill your entire blender with ice, add liquids, blend for a bit then add more ice until it is thick. How much ice to put in a Pina Colada? For the perfect frozen Pina Colada, you will want to add one and a half cups of ice for every serving. These drinks require a little more ice than typical drinks because of the large amount of liquids placed in them to create the drink. For a thicker drink blend using the highest settings so that the ice is almost creamy.